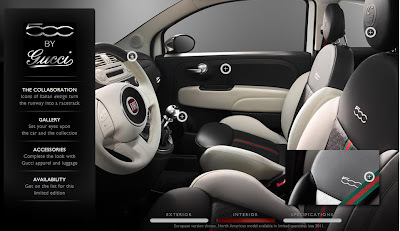 Fiat and Gucci unveiled the much anticipated Fiat 500 by Gucci yesterday, during the Fashion's Night Out Event held at Gucci's 5th Avenue showroom in New York. 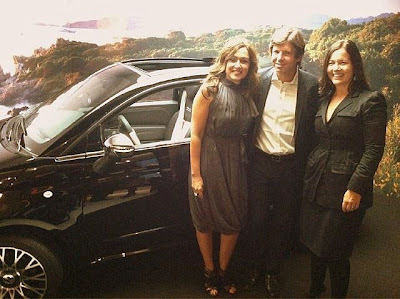 On hand were Laura Soave, Head of Fiat Brand in the US and Olivier François, newly appointed global Head of Fiat Brand and Chief Marketing Officer on September 1, 2011. 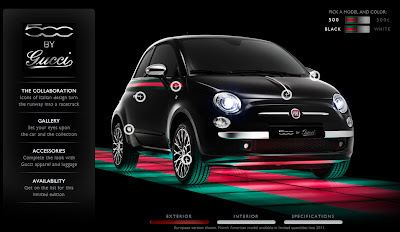 Along with yesterdays unveiling, Fiat USA has launched a 500 by Gucci site to further whet the appetite for this limited edition car. 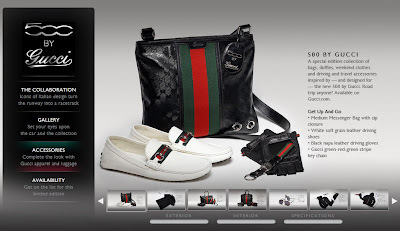 The sought after 500 by Gucci has already gathered 3,000 pre-orders from around the world. US orders are to begin shortly with vehicle deliveries anticipated at years end.